The OdJ observer who has seen more birds in December for more days and has input more data (31 days and 428 sightings) has been Gabriel Gallart, who gets a bird guide Guia dels Ocells de Catalunya, País Valencià i Balears and an Ornitho notebook. He didn't skip a single day of the month and has input data from different gardens, apart from taking photographs that he has uploaded to the web site. Consequently, this is a fair prize to perseverance. Other observers are worth mentioning for having also covered the 31 days of the month. They are Jordi Pareja, Lluïsa Pinyol, Guillem Brufau and Alfons Delgado-García, to whom we acknowledge their dedication to the project. Gabriel Gallart, 55, has a degree in Human and Physical Geography, specializing on climatology, a discipline in which he has studied the adaptation of living organisms to different climate conditions. Currently, he works as a Community Manager and Web Editor on behalf of the Barcelona City Council, where he takes care of the communication of information in different social networks. Gabriel tells us that he has been birding for more than 35 years and that OdJ suits him perfectly as it allows him to enter sightings from gardens where he has a daily opportunity to watch birds. He inputs data directly from his smartphone when he watches the birds and he owns a Nikon D90 camera fitted with a 300 mm objective with which he takes his pictures. This is a monthly contest, so during the current month of January all OdJ participants have a renewed opportunity to get the prize; all of you except the current winner, since those who have got it once are not eligible for future editions of the same prize, therefore... the race is open again! From time to time in our gardens birds show up with aberrant plumages that are not those expected for that species. The commonest aberrations are leucism and albinism; both are alterations that prevent the bird from producing melanin in part or completely at all. Leucistic birds have fully white plumage areas in place of the natural pigmented feathers of the species. One of the birds that most often presents this aberration is the Blackbird, a species that because of the black plumage in the male, the areas with pure white feathers contrast even more. Sparrows, Blackcaps and some finches are also prone to have leucistic individuals. 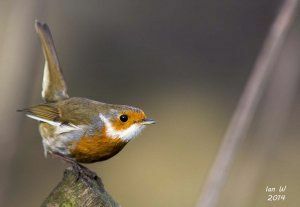 Maybe less frequent are Robins but as you can see in the image below of this bird from England, there are some that can show a weird look -but at the same time attractive look- recalling Santa Claus, as the English have named this bird: Santa Robin. "First brought to our attention in 2012, this remarkable leucistic bird with a Santa beard had already defied the odds by being amongst the 40% of Robins that survive their first year. Now it has survived at least three winters in Derbyshire, making it older than the average Robin.". Needless to say that the bird deserves recognition for surviving quite a long time (at a Robin scale, obviously) but even more for doing it with a plumage which is very different from that of its alikes. Do you get any such bird in your garden? If so, upload a photo to Ocells dels Jardins! Canada is much colder than here, where just a few days ago we still enjoyed kind of Summer weather. In this webcam in a bird feeder in Ontario we can see that cold has speared birds to visit the feeder quite often. Watch the videos recorded on previous days in which, a part from some lovely Blue Jays, a Rueffed Grouse (kind of Capercaillie) shows up in the feeder. How would you like that a Capercaille visits your feeder in your garden? And if you have to travel to the USA or Canada, remember that you can use those webcams of the Cornell Lab of Ornithology to keep training on the ID of American birds. Have fun! In spite that we are having summertime autumn, soon cold will come and with it birds to the feeders and gardens. 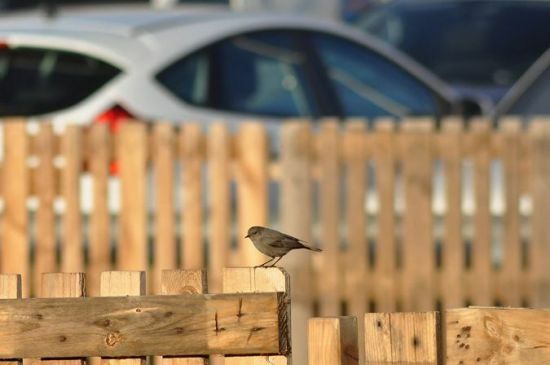 In fact, we can already notice an increase both in numbers and species in many gardens of the country after the summer parenthesis, which is usually poorer as far as birds in gardens are concerned. We'll soon get large quantities of Chaffinches, Black Redstarts, Robins, Blackcaps, Siskins, Thrushes, Blackbirds and a whole bunch of partial migrants that come down from the Central and Northern Europe to our warmer latitudes. In spite that we think our winter is cold, it is not much compared to that in the centre and North of the continent where, in addition, the presence of snow makes access to food much more difficult. This year we expect to achieve a good sampling of the whole country and reach cruising speed in the project Ocells dels Jardins so that data gathered by all participants are useful for a better knowledge of our birds. So, get ready your bird feeders, binoculars and cameras. The most interesting part of the show is coming soon! The Delta Birding Festival is ready to go! Do you fancy birding? The ICO, as a promoter of the Delta Birding Festival, proposes you to go with us to the Ebro Delta in September. Have a look at the calendar of activities on the web site and choose which you want to join! 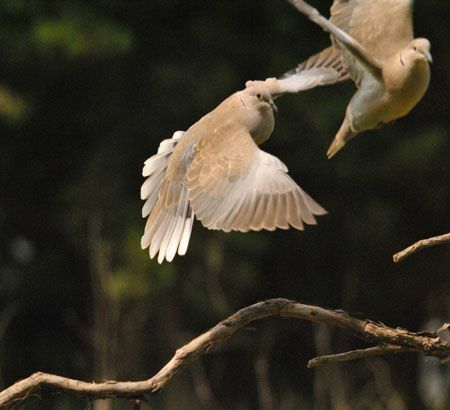 We are a little bit late this month but our selection of the month of june is a picture of two Collared Doves by Jaume Ventura in a garden in Palau-solità i Plegamans (Vallès Occidental). the image captures very well the two birds in flight, in a posture and under a light that gives it great beauty and elegance. Common birds can also award us with enchanting images! This garden is located close to fields and woods and that's why the species observed here are very varied, ranging from Jay to Pheasant, the latter a species that we don't usually watch in gardens. Jaume Ventura has posted quality photographs in other occasions, among which we can highlight the following pictures of Jay, Robin, Hoopoe and Common Sparrow. In this link http://www.tv3.cat/videos/5135791/Espai-Terra-dilluns-16-de-juny you can find (after minute 17) the interview in the program Espai Terra that the popular meteorologist Tomàs Molina did with Abel Julien as communication manager of the project Ocells dels Jardins. In the interview, that lasted around 10 minutes, Julien explained what the project is about, how to join it and how to enter information and gave some details about what can be done with citizen science projects. Program producers selected some pictures to illustrate the interview among the pictures of OdJ. Can you identify any of yours? This very same afternoon, june 16 at 19:30, Espai Terra, presented by Tomàs Molina, will talk about Ocells dels Jardins. Last weekend we have more than doubled the number of records in comparison to the weekend in which we had more records up to now. A good respons to the petition to do the Spring Census 2014. Spring is a season in which the activity in our gardens lowers down and there are less observations, as it can be seen in all countries where there is a similar project (for example, France and the UK). 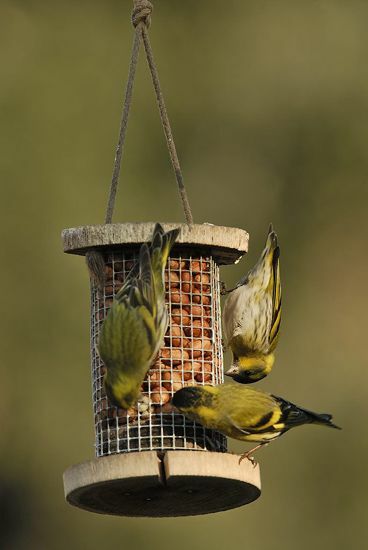 We will all agree that our gardens are much more active in winter, when cold forces birds to come to our feeders than in spring. In spite of this, last weekend has been the best covered so far by OdJ users. The Spring Census of Ocells dels Jardins in Catalonia 2014 will take place on the forthcoming weekend, saturday 31st May and Sunday 1st June. We ask OdJ users that, at any time along those two days, to count birds the same way they usually do, that is, controlling observation time in the gardens and reporting all species detected. The fact of having all volunteers censusing birds at the same time will allow us to get a snapshot of the bird species in our gardens during those two days. For future statistical analysis of the data we gather, it is very important to have standardised comparable data. It is not necessary to spend a very long time but it is true that an extended observation time, just by simple probability, will help detect more species than counting for a short while; therefore, we encourage participants to spend some time counting. However, if you have several gardens, it is more valuable to census all of them than spending a long time on just one. We look forward to your collaboration!